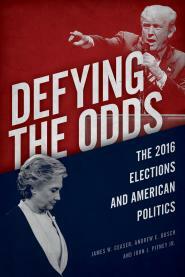 Defying the Odds compares and contrast Trump with others who have won the presidency. Inevitably the president is the focus, the essence of the crisis of the regime; the linchpin of its entire structure. It could not be otherwise. The character of a regime always reflects and expresses the character of its leader. It is he who appoints his executive staff. If he does not explicitly command what his aides and agents do, they in any event do what they sense and believe he wants them to do. The captain is responsible for his ship, the commander for his army. And Mr. Nixon has explicitly recognized this responsibility. If the president withdrew, this crisis would be resolved. Watergate scars would remain, of course. The debris would have to be cleaned up. There would still be many of the problems that have issued out of Watergate — not to mention the other mammoth problems our country faces. I am deeply aware, of course, that in recent weeks Richard Nixon has found several occasions to say that he must defend the office of the president, and that he therefore should not resign because that would weaken the office. But precisely the opposite is the case. In order to preserve the Presidency, Richard Nixon must resign as president. If future presidents are to carry out their grave responsibilities in the free and unfettered manner President Nixon desires, they must be able to inherit an office that has not been irrevocably weakened by a long, slow, agonizing, inch-by-inch process of attrition. As it now stands, the office of the president is in danger of succumbing to the death of a thousand cuts. The only way to save it is for the current president to resign, leaving the office free to defend itself with a new incumbent. Mr. Nixon also argues that it would be destructive of the office for a president to be hounded out of office because he happens to have a low rating in the polls. In normal circumstances I would agree. But we have in the present case a qualitative difference that hinges not on the fact of a low rating but on the reasons for that rating. The president’s current rating in the polls does not reflect a dissatisfaction with one, or two, or a dozen specific issues. Rather it reflects a cumulative loss of faith that has eroded his credibility and moral authority; a loss that, in my judgment, is beyond repair. This goes to the heart of the crisis of regime that is unique to Watergate. Finally, there is the fact that the office of the president is not the only institution for which we must be concerned. We need a strong president now as well as in the future. We need the balance wheel that alone can be provided by a president able to exercise the full authority of his office, or we run the risk of a runaway Congress that could commit us to new and dangerous programs from which we may never be able to extricate ourselves. But there is little point in protecting the office of the president if at the same time irreparable damage is done to the Republic as we have known it. I do not doubt that, as he sees and judges his own conduct, Richard Nixon has acted throughout this time of troubles for what he believed to be the well-being of his country. I hope and pray he will realize that the greatest and culminating action he can now take for his country is the renunciation of the world’s highest office. His countrymen und the historians of the future, I feel sure, would judge that action in terms of the courage, patriotism, and self-sacrifice it would so dramatically display.